Reason becomes the thinking man's Hello magazine in this new piece devoted to energetically fluffing the Atlas Shrugged 2 movie. Amusingly, in this puff-tastic item writer Brian Doherty somehow forgets to mention that Pt 1 was one of the most notorious box office bombs of 2011. Instead, he refers to an "official critical reception" that "wasn't that great" - a masterly piece of understatement, given the average review rating of 3.5 out of 10 - and asserts that "normal folk seemed to like it better than credentialed tastemakers" despite the fact that said "normal folk" singularly failed to show up at the box office, and that as usual Randroids block voted on net sites like Rotten Tomatoes to prop up Atlas' user rating. We also hear about "encouraging" dvd and on-demand sales. No figures are mentioned, so here's a couple: it's currently ranked #1,240 in Amazon, and we know they made at least 100,000 copies due to this distinctly un-Galtian screwup. They need about $18m or more so at $12.99 retail, do the math. Keeping with the Hello-type flavour, we also get gushing descriptions of the set design and acting that would be perhaps more appropriate for Posh'n'Becks' latest nursery interior. Even the old The Fountainhead movie gets a fluffing, with its dud reputation blamed on the studio editing it against Rand's will - despite the fact that Rand demanded, and got, unprecedented artistic control over the movie. A few tidbits sneak thru the PR blurbing. We learn that the real reason Part 2's been recast is because they didn't get binding contracts from the actors in Part 1 to do the followup; hence they all appear to have jumped out rather than end up once more in the same train wreck. We also learn that the producers have seemingly learned nothing from the previous debacle. They seem to think "the look" of the film is the magic bullet for success, despite the fact that the basic Randian absurdities highlighted by Greg in his great review below are the fundamental problems with the project - and that they get worse as the book progresses. In fact the producers seem to have doubled down on rather than diluted the Rand factor, with anachronistic phrases like "looters" and "moochers" now featuring prominently in the script. In other words, no matter how much the Reason blurb-o-mat tries to talk it up, Pt 2 sounds a lot like Pt 1. Only worse. 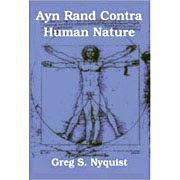 Atlas Shrugged Part 1 and human nature. With the threatened second version of Atlas Shrugged beginning production, I finally got around to slogging my way through the first part of this epic work in progress, which is now available as a streaming option over at Netflix. I can see quite clearly why the movie failed at the box office. It's hardly the fault of the director or the actors or production values. While obviously not a big budget effort, no amount of money or high-end production values could have salvaged this turkey. Nor would better direction or better acting make a jot of difference. The movie fails because its characters, particularly the protagonists, are grossly unrealistic; and they are unrealistic because Rand's novel demonstrates a complete cluelessness about human nature. Human beings simply don't talk or behave like they are shown talking and behaving in this movie. People can tolerate a very wide degree of fantasy and irrealism in a movie; but they can't tolerate behavior that doesn't jive with their sense of human nature. The situations may be as unrealistic as one likes; but if human beings do not behave as human beings, the movie will come off as bewildering and senseless. Atlas Shrugged: Part 1 actually starts off somewhat promising. Using news reports compiled in clever editing, we get an exposition of a world heading toward bankruptcy and anarchy. The attempt to justify the re-emergence of railroads in 2016 as a consequence of high gas prices may be a bit over the top, but then, if the movie had been graced by realistic human beings, this would not have mattered. The first hint that the movie will quickly go off the rails comes when we hear the novel's signature line, spoken by a tramp in a diner, "Who is John Galt." This catch phrase never really convinces in the novel, and in the movie it immediately strikes a note of absurdity. This is followed by an even more preposterous scene involving a shadowy John Galt, dressed in hat and trench coat. He utters some Randian boilerplate to Midas Mulligan, after which we are told that Mulligan has subsequently disappeared without a trace. "Atlas Shrugged Part 2", featuring an all new cast, has started shooting. This time it will work, really. Review of Weiss' "Ayn Rand Nation"
Gary Weiss' new tome, Ayn Rand Nation, looks to be the first critical examination of Rand from the Left that we've seen since Ellis' Is Objectivism a Religion? It's well written, well researched, and, despite all the anti-market innuendo, makes for an absorbing read. Its main value is the glimpse it gives us into the lives of several prominent Objectivists. A secondary virtue of the book is that it provides a critique of Rand's doctrinaire laissez-faire capitalism from a strong pro-regulation, pro-big government view. Sometimes Weiss' arguments are very good; sometimes they are not so good. The books main weaknesses is that it tries to squeeze Objectivism and the Tea Party into a left-wing narrative that is, in many important respects, not in accord with the facts. Weiss' main thesis is that Rand is much more influential than people realize and that, unless she is vigorously opposed by morally enlightened individuals (i.e., people who agree with Mr. Weiss), American society will be hijacked by Objectivism. He quotes ARI Director Yaron Brook's blueprint for the future: ""A hundred years from now, I think Objectivism will be the dominant secular philosophy in the United States." Weiss believes that Brook's prediction "makes logical sense." I suspect Weiss regards the threat of Objectivism as credible because he buys into the way Rand frames the debate between left and right. Weiss gives credence to the left-wing carricature of conservatism as a mean, anti-government, anti-regulation, anti-welfare state ideology. He believes, for instance, that the Tea Party advocates full "laissez-faire" capitalism, and describes Congressman Paul Ryan's plan to save Medicare "an incremental step toward a goal long favored by Objectivists — abolition of Medicare." For Weiss, right-wing economic ideology is merely a rationalization for the predatory and callous behavior of business elites on Wall Street, and he spends much of Ayn Rand Nation attempting to explain why decent people in the Tea Party buy into an ideology which, he contends, is not in their self-interest. He fails to realize that when Tea Partiers complain about over-regulation or high taxes, they are not thinking exclusively in terms of Sarbanes–Oxley or Dodd-Frank. Indeed, they may not be thinking of Wall Street at all, but of Main Street. Starting a business not only involves huge financial risks (as many businesses fail, something leftist critics of the market such as Weiss blithely ignore), but may involve wading through oceans of bureaucratic red tape. While middle class families struggle to pay their mortgages, tax burdens remain onerous. Meanwhile, local, state, and federal governments continue to amass regulations. California recently passed a law that requires child seats until a kid is at least 4'9" tall or nine years old. On the Federal level we have the immense regulatory burden of Obamacare, which is threatening to make health care unaffordable to the middle class. Regulations are so complex that they can neither be followed nor enforced. Instead, they merely give bureaucrats arbitrary power over the citizenry, as we see with the EPA, where we find public officials declaring this or that piece of private property a "wetlands," much to the detriment to the titular owners of the property. While such laws (or bureaucratic meddling) may be "well-meaning," they do come off as rather patronizing and heavy-handed, if not actually harmful and tyrannical. They are poles apart from the pioneer spirit that once prevailed in the land of the free and home of the brave.